The Justice and Development Party (AKP) has been in power since 2002. This book is the first book-length analysis to chart the rise and development of the party from its Islamist roots through to government, analysing in particular its internal organisation and dynamics. Since its foundation in 2001, the AKP seems to have been more successful than any other party with an Islamic background in the history of the Turkish Republic. Drawing on interviews and analyses of quantitative data from primary and secondary sources, the author examines the party’s character as an organisation, its internal power structure, its electoral roots, strategy and leadership in the context of its organisational environment - including its constitution, major veto players as well as international actors. Going beyond a mere analysis of Turkish politics and parties, this book applies classical theories and models on political parties to the Turkish case. 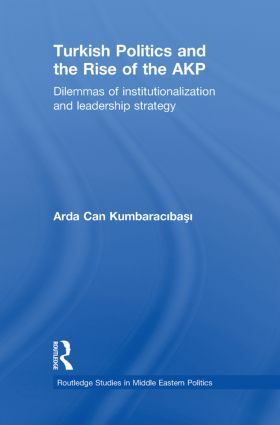 Focusing on the notion of ‘institutionalisation’ and its two main dimensions, autonomy and ‘systemness’, it makes an original contribution to both the empirical study of the AKP, contemporary Turkish Politics and the general discussion on theories of party organisation.